If you’ve ever wondered how to make an internet meme, now’s your chance to get in on all the fun. Internet memes come in many forms and can roughly be described as an idea or thing that naturally goes viral online. Memes can be photos, videos, articles, GIFs, quotes, news stories, songs or even birthday wishes. Anything you can think of, to be honest. To keep things simple, we’ll focus on creating image-based memes in this particular tutorial. If you're already familiar with some of the Internet’s biggest and most successfully viral memes like Rages Faces, Advice Animals, Overly Attached Girlfriend, and others, then you probably have a good understanding of what types of memes tend to be the funniest and shareable. If not, check out our Internet Memes 101 page. You’ll get a quick breakdown of where to find some of the most popular memes. If you choose to create your meme from scratch, that’s totally up to you. You’ll probably need a program like Photoshop or Gimp, depending on how much detail you want to put into your meme. But if you want to make something quick and straightforward — especially using images of an existing meme, like Socially Awkward Penguin — then you can use one of the internet’s popular meme creation tools to save you the time and hassle of doing it all from scratch. 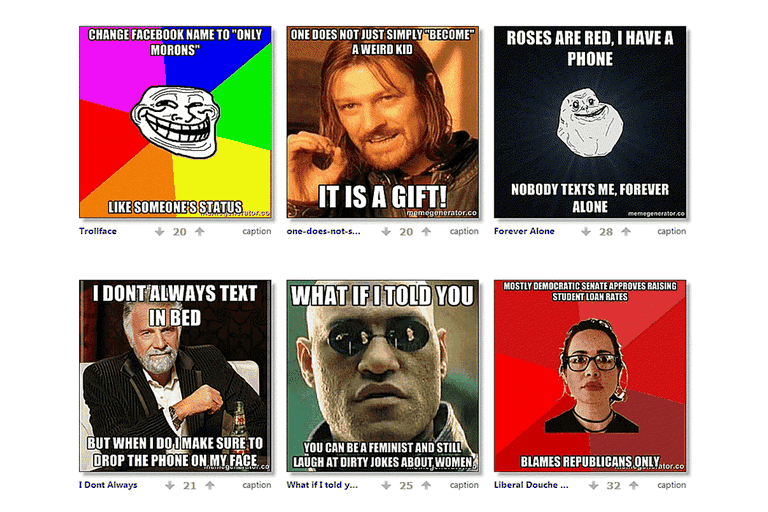 Check out the top 10 most popular meme generator tools here. You can choose any tool you want, but for this tutorial, we’ll be using Meme Generator. This website already has nearly every popular meme on the web, so you can choose any one of them to build your meme. You can browse through the selection of images that Meme Generator (and most other meme creator websites) have on their front page. Think about the message you’re trying to send online. If you’re already familiar with specific memes, you probably already know that certain ones are used in certain situations. For example, “Success Kid” is a popular one that people use to describe pretty normal situations that lead to unexpected events of success. Browse through a bunch of them here. Click the big red Caption an Image button in the top right corner of the screen and select your image from the thumbnails, search for it by name or optionally upload your own. Most image macro memes (especially memes part of the Advice Animal series) include white textual captions written in all-caps Impact font—a subtle but strong characteristic of internet meme culture. Meme Generator gives you two boxes where you can type text to show on the top and bottom part of the image. The text appears automatically as you type it and is reformatted to fit the size of the image correctly. Once you’re happy with your text, click the appropriate flag to tell Meme Generator which language you want and then click Generate to finish it. That’s all there is to make the most straightforward meme. The hardest part is coming up with a witty and funny caption that everyone can relate to and automatically wants to share. If you think others would like your meme, you can share your meme using the social media share buttons provided to the side of your finished meme on Meme Generator. Your meme is automatically shared for all to see on the Meme Generator website, so if it becomes popular, you could see it start popping up in other places online as others share it.